How to pick a german shepherd puppy? I am getting a German Shepherd. I want a certain colour, same as the on in the picture..
What pattern should i look for in a puppy and what colouring.. can you maybe send me a photo of the puppy? Also at what age should i start training my new puppy? The kind of German Shepherd that you have included a picture of above is a black and red saddleback. They also come in black and tan and you will hear Black & Tan saddleback quite often describing the color and pattern you see in the German Shepherd above. Speak with the breeders or GSD rescue to find out more about the puppy you are interested in. The puppies don't start out that way though just so you'll know. Typically they are very, very dark all over and lighten up as they age. And as for training, you can start them out right away as soon as you bring them home - easily as young as 8 weeks old or so. Just do it in very short increments and add more time as they grow up. 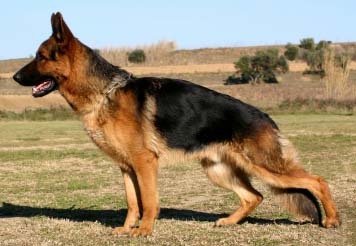 Read here to learn more about German Shepherd coat colors and German Shepherd coat patterns. Check out this page for more information on German Shepherd growth and development.